Episcopal church services are congregational. In the pews you will find the Book of Common Prayer. In the Book of Common Prayer, the large print is the actual service. The smaller print gives directions to ministers and people for conduct of the service. You may wonder when to stand or kneel. Practices vary---even among individual Episcopalians. The general rule is to stand to sing---hymns (found in the Hymnal in the pews) and other songs (many of them from the Holy Bible) called canticles or chants and printed as part of the service. We stand, too, to say our affirmation of faith, the Creed; and for the reading of the Gospel in the Holy Eucharist. Psalms are said standing. We sit during readings from the Old Testament or New Testament Letters, the sermon, and the choir anthems. We stand or kneel for prayer to show our gratefulness to God for accepting us as children or as an act of humility before God. While some parts of the services are always the same, others change. At the Holy Eucharist, for example, two or three Bible selections are read. These change each Sunday. So do the psalms. Certain of the prayers also change, in order to provide variety. Page numbers for parts of the service printed elsewhere in the Book are usually announced or given in the service bulletin. But do not be embarrassed to ask your neighbour for the page number. You will find the services of the Episcopal Church beautiful in their ordered dignity, God-centred, and yet mindful of the nature and needs of human beings. 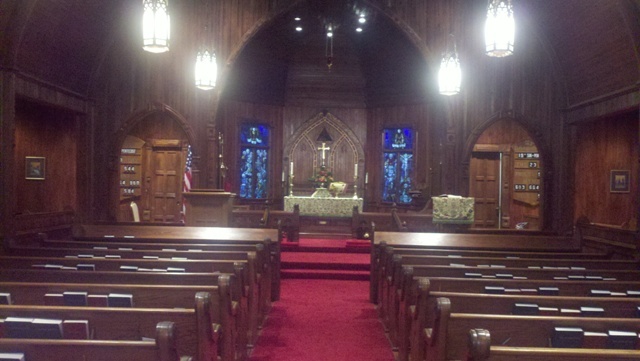 Most Episcopalians do not talk in church before a service but use this time for personal meditation and devotions.